Hey, I bought this game a couple of days ago and I really like it. The game has the best AI I've ever seen and the complexity vs simplicity is perfect, not too complicated but not too simple. Only thing I dislike is the shape of the "hexes". Are there any benefits of having squares instead of hexagons? 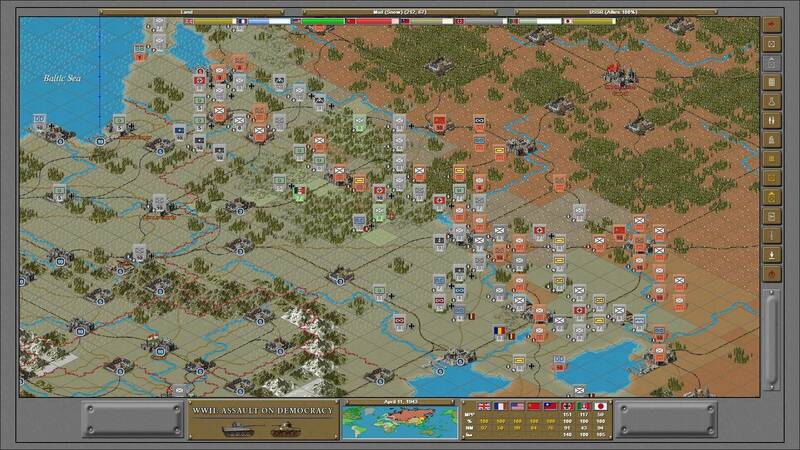 Anyway, I'm playing the grand campaign 1938 (not sure of exact name) as axis, and so far it has gone pretty well. Poland,France,Low Countries,Denmark,Yugoslavia,Greece,Egypt,Syria,Iraq,Iran,Sudan - All of which were conquered before the war with Russia. I'm fighting in Ethiopia with the Italians, and I have occupied about half of China with Japan. I'm getting alot of MPP's (about 400-600/turn), sometimes I have more than 100 left at the end of turn..
1.What am I doing wrong? What do I need to do to increase the speed of my advance? 3. Can I research something that lets me buy more inf. divisons for example? 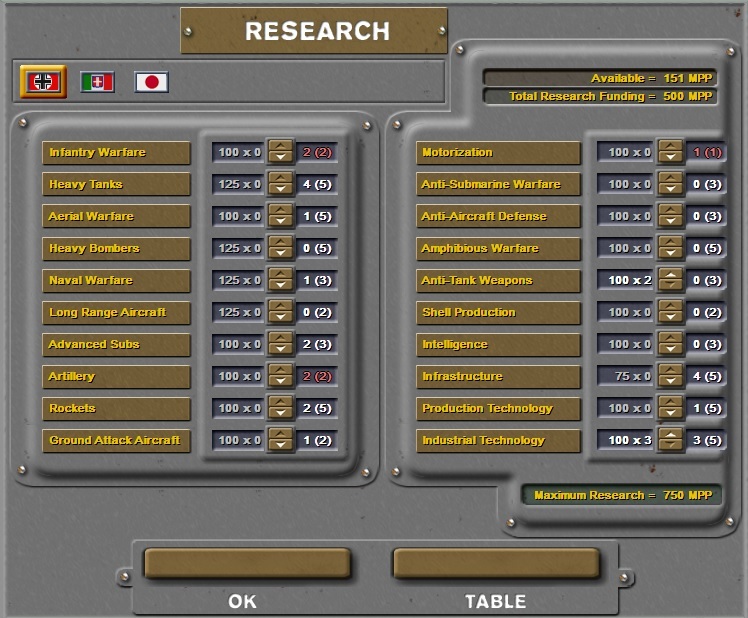 I really need more and faster units to be able to keep enemies encircled, but problem is I can't buy more units..
4. Any other advice ? The battle with USSR should be priority #1 for Germany. However from the above it sounds as if conquering Egypt,Syria,Iraq,Iran and Sudan was your priority first. I would suggest after the fall of France that you dedicate as many resources as possible for a spring 41' attack on USSR. It is easy to throw your strongest forces at the weaker minor nations, while ignoring the bear in the room (USSR). Doing so will allow USSR too much time to build up (and they will build up). You need to strike them hard and fast and go as deep as possible in 1941, as it will never be easier after that until you feel the tide of war swing ultimately on your side. Concentrate your firepower (Tanks + Bombers) to take major cities. Avoid leaving your best forces in a slug fest in swampy areas, (immediately south of Leningrad is a great example). Encircling enemies can be hard, but it can be done. I should add I haven't played a "vanilla" game for over 2 years, I've modded my campaign so much. But the above advice should be a good start. PS - You may want to invest more in Air, D-Day is an air war as much as everything else. You seem ill prepared to defend against constant bombarding from UK/USA. - Play carefully with your armour to minimise losses and build up elite reinforcements by making the most of the easy pickings until the USSR starts fielding armour of it's own. It makes a massive difference to your battle odds - 13 strength panzers are almost unstoppable. - Generally I find advancing quickly to be overrated. If you're taking loads of USSR territory but not killing anything, you're not gaining much until you get to the real objectives i.e. Moscow/Stalingrad/Leningrad (and even then they won't automatically win you the match - I've taken Moscow in early '42 and eventually got pushed out in '44 because until you get the oil, the Russian income is too great). If you're slowly grinding through but coming out on top in every engagement then that's a bigger win imo. In the war of attrition, eventually their army will get smaller and smaller. - From a more meta point of view, I think playing as the Germans in all grand scenarios is pretty tough, but I've had my best successes in campaigns that let me pick the Barbarossa start date. I think, unless you've got a totally unique/wacky plan of action in mind, invasion of the USSR should be done no later than it was historically (and ideally 1-2 months earlier). I have been running an AoD tournament the last couple of years. Last time we had 12 players. We have a 'new' modification that we are planning on playing on the next tournament round...starting mid-October 2017. (called "Allies Stronger")... and some of us are playing it now... after a little more play, I will probably be tweaking the victory conditions. Hope you are still playing AoD ! !